Threshold topper, white Pristine Complete allergy cover, and "Sinkhole" the mattress. Who hasn't felt a little like the Princess and the Pea at times? In real life and not fairy tales this usually happens when your back aches because of a worn out mattress. A pile of mattress toppers generally won't work because the foundation is the problem. 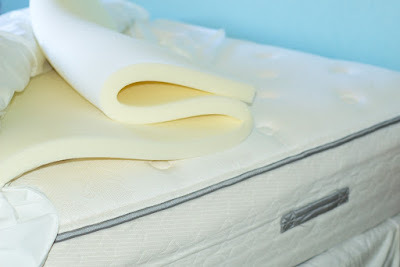 The right topper match for the particular mattress can be a troublesome task. Wait! Toppers smell toxic when new. Yes, some will need to air out longer than others, but the change in fire retardant laws, California Technical Bulletin 117-2-13, could be reducing unnecessary chemicals in foam materials. Also, toxicity awareness seems to be growing. CertiPUR-US isn't perfect but offers the sensitive consumer some guidelines to (somewhat) count on. Their approved foams are low VOC and without ozone depleters, PBDE flame retardants, heavy metals, formaldehyde, or phthalates. More on this topic at Debra Lynn Dadd's Q & A and here. "When traveling you're stuck with the mattress they provide." During my summer travels a hotel's newer mattress was a pretty easy fix. A $25 purchase of a basic polyurethane foam topper from Target. For those who are multiple-chemical sensitive or scent sensitive, we have to allow time for the new topper to air out. This is a pain when traveling because you have to think ahead and prepare for just-in-case mattress situations. A note about sink-hole mattresses, if you can, do yourself a favor and replace it if at all possible. Your quality of life with thank you and productivity will increase. If you're stuck like I was, then consider temporary solutions which generally boil down to thick cardboard products or stiff foam similar to a thick exercise mat. Every mattress and back that has to sleep on it will be a personal situation. One answer will not work for everyone. 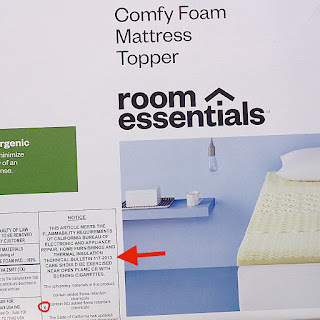 Here are some options: Google "sagging mattress support" or take a look at this SagsAway Sagging Mattress Support (even if you don't buy this, the Amazon listing has some helpful information. This is not a paid endorsement. I bought one and use it on the sofa). Tip: Problem-solve each side of the bed separately. The rock-hard, full-sized mattress, even with an aged three-inch memory foam topper seemed comfy, but the low-back pain in the middle of the night was a red-flag indicator for me to abandon ship. At least the rental owner had supplied toppers. The ancient sofa which was probably 1960s patio furniture offered box-spring comfort (sarcasm). I pulled a different memory foam topper off of the king-sized bed and folded it in half--that's six inches of cushy softness--and put it on the sofa. Not too far into the night, a mysterious odor emanated from someplace, but I couldn't figure out where. The Raid-like odor increased. Then a light bulb went off in my brain. My body temperature warmed the topper which then released a dormant fragrance. Someone had sprayed this foam, maybe when it originally had the new smell, with a Raid-like cologne and really saturated it. The warmer it got the stronger the odor. I jumped up with the enthusiasm of someone covered in bees and disposed of the offending foam in an unused (and fragrant) bedroom. Then moved on to the next bed like Goldilocks. This was my last try. The queen mattress had seemed newish with a puffy pillow-like top, but this was the one I nicknamed "sinkhole." Maybe kids had used it for a trampoline. The ends were still good but the middle wasn't. No matter the topper tried, this was a losing battle because the mattress coils were shot. I had to make this place work because this was the only rental left in town. Another tip: plan ahead and have options. I'd brought along a two-inch thick egg crate memory foam topper and gave it try. Softness, yes, but my back ached from sinking into the hole. Because the mattress had a pillowy top you couldn't just buy a thick poly-topper from Bed, Bath, and Beyond and sink into comfort. I did buy the Wamsutta polyester stuffed fiberbed, but when combined with the mattress I ended up with neck pain that I couldn't shake for days. I also tried the basic topper used on the hotel bed, but it didn't add enough softness. The weird thing about an aging pillow-top mattress is that the foam top breaks down and you still end up with back pain from the hard springs as if a giant had wrung your spine out like a sponge. 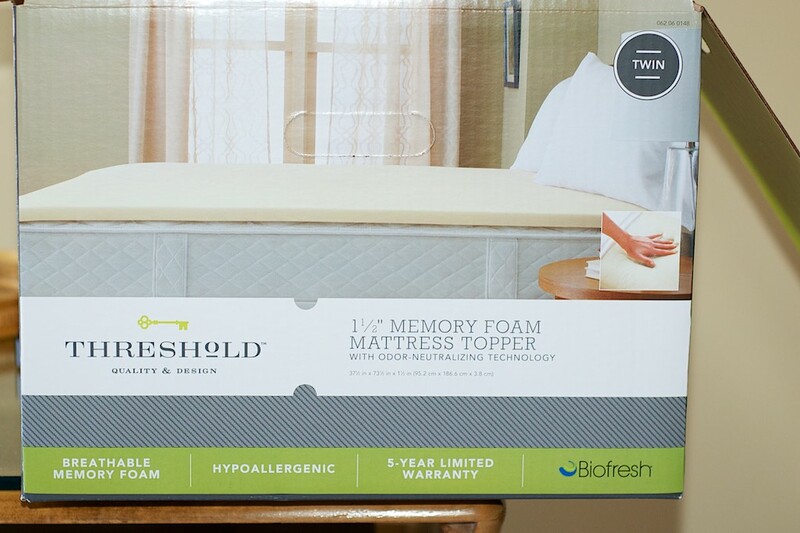 I ended up buying Authentic Comfort's Threshold Fresh Scent 1.5-inch Memory Foam Topper that required airing out for a minimum of four days. ("Fresh Scent" in the name is confusing because it doesn't seem to be scented.) After the airing time, I zipped it into an allergy cover and used it. The new foam odor continued to linger for a number of days, but the softness it added made it a compromise I chose to live with. Foam of any other composition or thickness either created a strangely firmer raft-like feel or was too spongy and contributed to back pain. 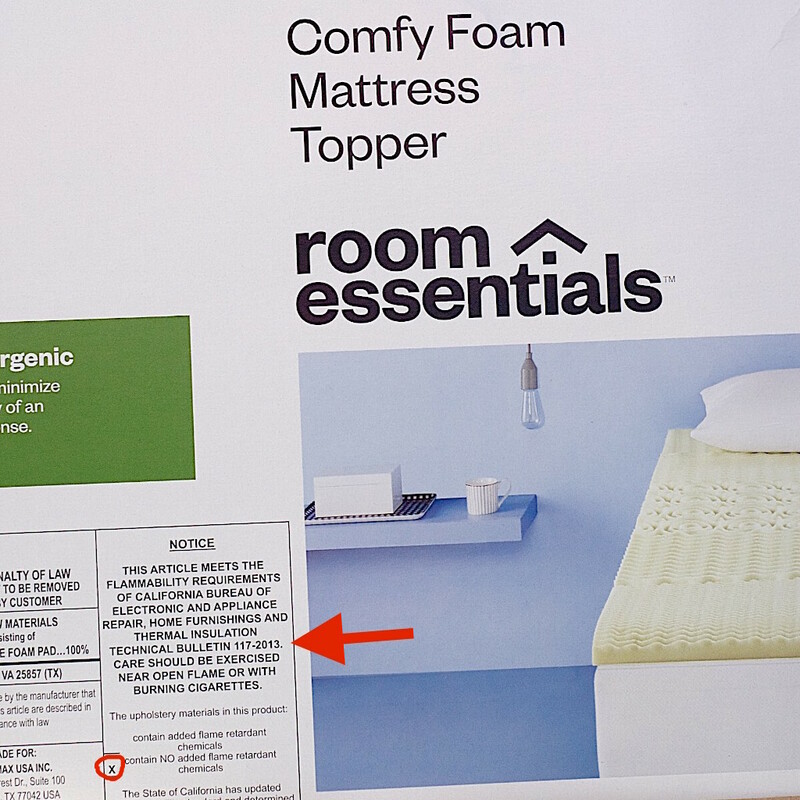 A tip: you might need to get a different pillow when adding a topper to your mattress. It might need to be thinner, or a different shape (rectangle with an indented area in the middle or maybe a roll style), or one made of more pliable materials like buckwheat. The goal is to keep your neck and spine aligned. I can actually feel my sinus passages open up when my neck and back are aligned. I'm using a customizable buckwheat pillow (it has a zipper so I can remove some of the buckwheat). Sometimes you have to move on—to the next bed! *A note on wool and feathers. They can be options for allergy sufferers. The cleaning process makes the difference. If they still smell like the farm, then keep looking. Also, consider the fabric casing. Can you deal with organic cotton? If not, ask about how the fabrics have been processed. I look for non-organic cotton free from formaldehyde, chlorine, heavy metals, and harmful chemicals including scents. When traveling use an allergy cover with bed bug-proof zipper. More on natural, synthetic, and luxury toppers in this article from the Independent. I own Cuddledown's Deluxe Box Featherbed. Allergy-friendly choices at Allergy Best Buys here. Dewoolfson Down in North Carolina.